As a junior tennis player in Canada you trained at ACE Burlington. How was your overall experience at ACE and did it help prepare you for college? Training at ACE really helped my game mature in all aspects. I was put in a very competitive environment with many strong players together and we pushed each other in the weight room and on the tennis court. The way we trained and the daily competitiveness made the transition to college tennis a smooth one. When you first got to college what were some of the challenges you faced both with school and tennis? The first couple of months were very challenging; each day something new was happening. As a freshman you don’t know what to expect and so the first couple of months is getting familiar with your surroundings and settling into your daily routine. The culture in Arkansas is much different than what I am used to and that took some time to adjust to. How did you cope with these challenges? Did you have to learn to manage your time better and/or did you receive help from the Athletic Department? My coaches and teammates really helped in making the transition from high school to college life as easy as possible for me. Although I did not have a tough time adjusting, there would always be someone on the team available to help out whenever I needed. Time management was also very important. Being a student athlete, your time is very limited and so I had to properly plan out how I was going to approach each day. How has playing college tennis changed your game? Are you mentally and physically stronger? College tennis has really taught me how to be a tennis player. Prior to college, I felt that I was a good ball striker. Many North American’s are great ball strikers, but, playing against guys from all over the world that had some with the most awkward technique has taught me that having pretty strokes and hitting a clean ball will not get you the wins. Playing in the SEC everybody is good. Getting the wins all comes down to who is physically and mentally stronger, and these are two areas in which I feel I have had the most improvement. 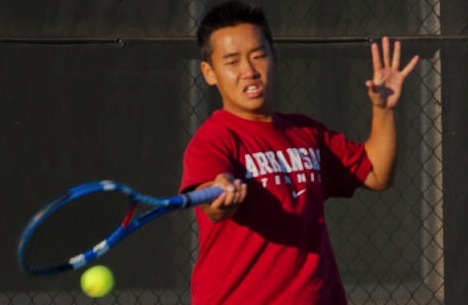 Arkansas is in the SEC, a powerhouse conference in college tennis. What are some of the benefits playing for a school in such a conference? The benefit of playing in such a strong conference is being able to compete against the nation’s best. Week in and week out whether you are playing number 1 or 6 you are playing very good players. Each week you get to test yourself and see where you stand against the top players. You are now entering your junior (3rd) year at Arkansas and there will be a new Head Coach. What are your thoughts on the coaching change and do you feel your experience will help your team remain strong through this change? It’s a bitter sweet feeling. In two years, I had developed a very strong relationship with my coach and it’s sad to see him go. But, with the new coach coming, it gives us new life. The team had been underachieving in the last couple of years, and so with a new coach coming in we are all coming back to school with a new mindset, motivated to get the job done. We are a very close knit team and our team will only get stronger with this change. Have you found there to be many differences between living in Canada and living in Arkansas? At first I felt a huge difference living in Arkansas. The people are different and the culture is very different. Canada is a very multicultural place, and so I would be surrounded with more Asians. In Arkansas, the Asian population is not nearly as large as it is in the GTA. People were surprised to meet an Asian who could speak fluent English like an ‘‘American’’. As time passed, the people got used to it and I got used to being looked at like I was an alien. Do you have plans for after graduating college? Are you going to continue playing tennis or pursue a different career path? Playing tennis all my life, I would never want to stop. If my game progress well in college and improves each year and I feel confident in myself then I would love to pursue a career in tennis. I have no specific plans, as you never know what opportunities are presented to you in life.